Complete trapping regulations, season limits, registration stations, survey reports and more can be found at the Michigan Department of Natural Resources website. 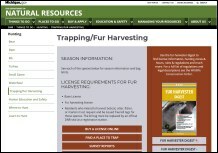 Click image on right to view the MI-DNR Trapping/Fur Harvesting page. The 2018 Michigan Fur Harvester Digest can be viewed or downloaded by clicking the image. The Digest has complete information regarding zones, season dates, regulation changes and more. Complete trapping regulations, season limits, registration stations, survey reports and more can be found at the Michigan Department of Natural Resources website. Click image on above to view the MI-DNR Trapping/Fur Harvesting page. The 2018 Michigan Fur Harvester Digest can be viewed or downloaded by clicking the image above. The Digest has complete information regarding zones, season dates, regulation changes and more.